Chinese rose is a beautiful flowering houseplant that almost all year round pleases large bright flowers. It is unpretentious, healthy, perfectly decorates the apartment – however, it is widely believed that the hibiscus is not to keep the house: that insidious and evil plant that loves negative energy. But other signs say that China rose is good for attracting love in the house. The myth that Chinese rose not to keep the house, it is very common. It is connected primarily with signs and beliefs and not any specific facts. Some call this plant the bloody: it is said that it feeds on negative energy and makes living in the home unpleasant emotions. Explain that the hibiscus grow well in the corridors of hospitals and clinics, where the suffering of many people. In fact hospitals Chinese rose well acclimatized most of all, because in the spacious halls through the large Windows let in plenty of light, and hibiscus – very photophilous plant. There is also a belief that the hibiscus begins to bloom beautifully when premonition of someone's death. This myth just to refute: many fans of indoor plants Chinese rose blooms in a few years, and none of that time not dying. With proper care the flowers appear on the plant year-round. Sensitive people call hibiscus the source of fear and anguish, but most likely their experiences are entrenched opinion that the Chinese threat rose. There are opposite signs. So, it is believed that hibiscus can bring in-house love: single women are often advised to grow this plant. Chinese rose is responsible for passion and passionate relationship, it can regain the feelings of spouses who have lived together for many years. To believe or not to believe these signs – the choice of the person. 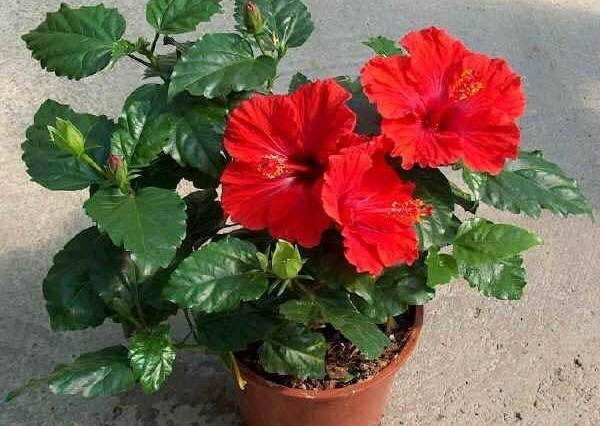 But there are studies that prove that the signs only work because people believe in them: growing hibiscus at home and for fear of his treacherous, it is possible to constantly monitor the unhappiness and every trouble to blame the plant. And from the point of view of botany and floriculture to grow hibiscus at home – a pleasure. This is a very undemanding plant that grows well in the light and does not require frequent watering. But if every day to spray it and periodically trimmed, it will grow amazingly beautiful tree. The main advantage of Chinese rose – its incredibly beautiful flowers. Keep it short – about two days, but new buds with proper care appearing all the time. Have hibiscus and a few drawbacks: this plant can grow quite large, so you need to find a place to host it. It's a pretty expensive potted plants: even a small shaft can cost several hundred rubles. In addition, the Chinese rose often exposed to pests.